Magento OMS has a product type known as virtual products. This type of product allows merchants to sell and process orders with items that don’t require “physical shipments” and configure whether “stock management” is enabled or not for a specific SKU. A specific SKU can be flagged as having “unlimited” stock, which will mean that the source in question will be able to ship any amount of orders for such a SKU. The “unlimited” flag can be defined in the stock snapshot message. In case the flag is set as true the value provided for that SKU in the qty field will be ignored by OMS. 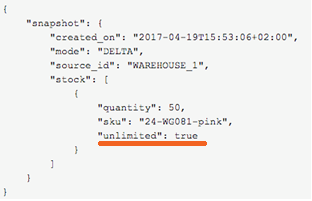 For new orders with an SKU that have been flagged as “unlimited” in at least one source, the OMS doesn’t validate the stock quantities. Upon import of the order with such an item the order will be hard allocated directly. Other order flow processes remain unchanged. This solution allows for sourcing virtual goods from sources that indicated unlimited stock flag. To make it explicit for a specific SKU, if stock management is not desired or not at the source level, there is a specific flag for any SKU to indicate we don’t manage stock. Stock snapshot allows indicating Unlimited flag for a specific SKU in a defined source. Such SKUs will never be canceled by OMS and will be fulfilled by the sources that have the flag enabled. This makes the solution much more flexible as any products can define whether stock management should be disabled. Virtual items can support pre-order with a street date. In case a virtual product is a pre-order, and the street date arrives, the order will be hard allocated to the source providing “unlimited” stock. In case none of the sources have stock available, and none have provided the unlimited flag, the order will be updated to backorder or canceled, depending on OMS configuration. Also in the case of order lines with unlimited stock sourcing rules remain in place. The order will get allocated to the source with the highest score according to rules. On the other hand, the product list (Products > Catalogue: Items and Options) display a column called “type” where you can identify the virtual products. Additionally, there is a filter available that allows you to find products by type easily. Please, go to the section “User Guides” for more information about Catalogue in Admin.